Dizzy Gillespie and the Lionel Hampton Orchestra performed in Festival Hall (now Morsani Hall) on Saturday, April 7, 1990. Two of the great, Mufasa-esque lions of be-bop era jazz conspired together for a performance on the stage at Morsani Hall on Saturday, April 7, 1990, and, surprisingly, it didn’t blow up. However, one can only speculate about what happened to the minds of the audience. Vibes virtuoso Lionel Hampton, with his Orchestra, hosted trumpeter par excellence John Birks Gillespie, best known as “Dizzy,” in a jazz concert for the record books. At the time, Dizzy was 72 years old, a Kennedy Center Honors recipient that year, and, three short years after his Straz Center engagement, would die an American legend in Englewood, New Jersey. When Dizzy blew, his neck and face puffed like a set of billows, his eyes bugged and his signature up-turned-trumpet bell gave him his distinctive, original look. The beret, sharp goatee and dark spectacles helped. Dizzy, in the scope of jazz, held a special place as a musician and African-American man who pushed himself to the limits of his imagination and then some, becoming a cultural ambassador, a beloved American icon and a superior improvisational artist. Plus, he was so darn funny. Who else could have convinced President Jimmy Carter, in 1978, to record the lyrics for a rendition of Gillespie’s own famed tune, “Salt Peanuts”? Dizzy, who credits Afro-Cuban Godfather Mario Bauza as his musical father, assumed the mantle of Bauza’s work and became one of pioneers of Afro-Cuban/Latin Jazz in American music. By the end of his career, Dizzy had 14 honorary degrees and a Grammy® Lifetime Achievement Award. He’d performed with Cab Calloway, Teddy Hill Band, Charlie Parker, Thelonious Monk, Ella Fitzgerald, John Coltrane, Yusef Lateef and personally discovered Arturo Sandoval. In 1964, Gillespie put himself forth as an independent write-in candidate for the presidential race, citing his Cabinet, which would include Miles Davis as Director of the CIA and Charles Mingus as the Secretary of Peace. Phyllis Diller, he noted, would run on his ticket as VP. 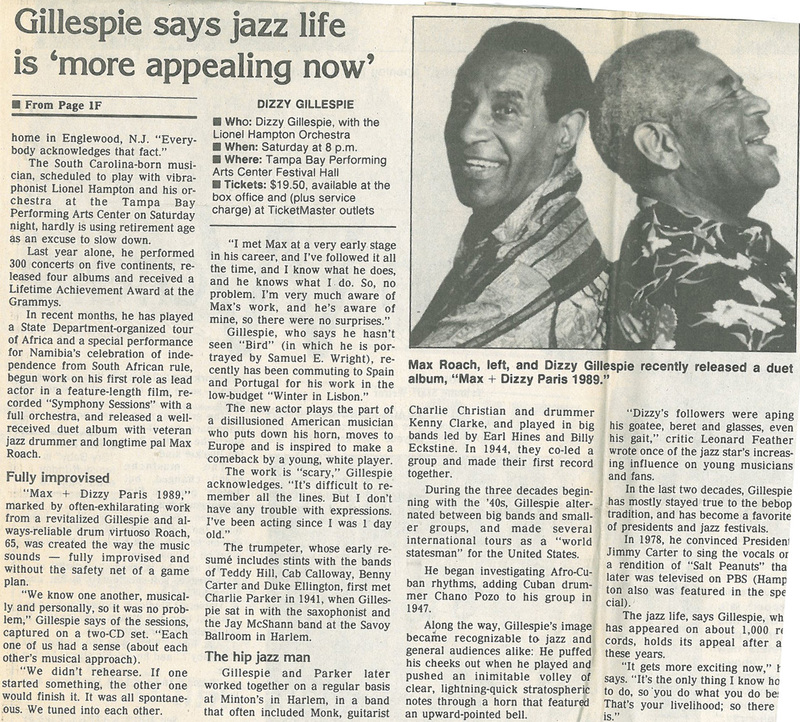 Gillespie appeared on more than 1,000 records, and, in this one-night-only appearance, in the flesh on our stage with his good friend and equal legend, Lionel Hampton. Hampton also sported an impressive collection of honorary doctorates and would later earn the National Medal of Arts from President Clinton. Hampton died in New York City in 2002. He was 94 years old. The show, billed as “Dizzy Gillespie with the Lionel Hampton Orchestra,” played at 8 p.m. with tickets at $19.50. Again: if only we had a time machine. 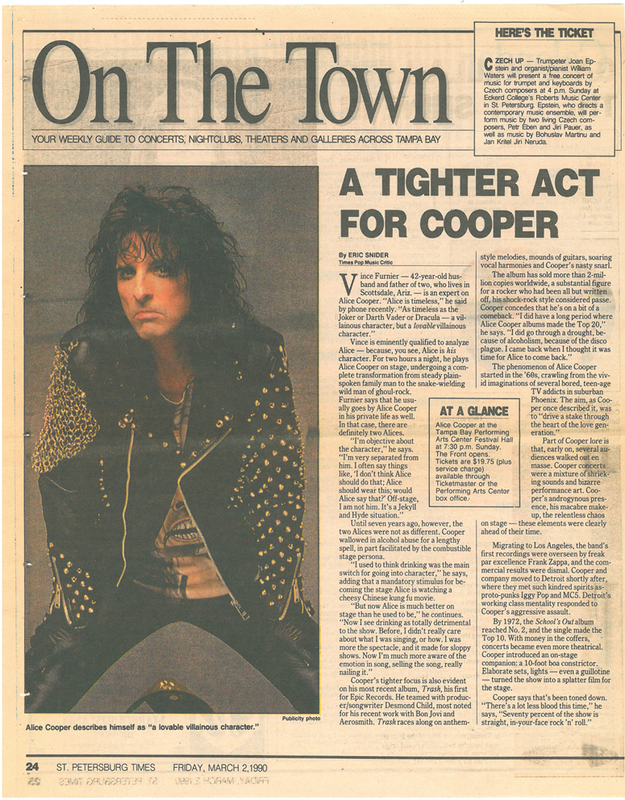 This article appeared in the St. Petersburg Times as a feature of the “On The Town” section and profiled Alice Cooper’s dual identity. Proto-typical shock rocker Alice Cooper performed in “Festival Hall” (Morsani) on, ironically, a Sunday. The March 4 show here marked a stop on Cooper’s 1990 comeback tour, the same year a young man the world would know as Marilyn Manson was taking classes at Broward Community College in Fort Lauderdale. When the pop music world reeled over Manson’s taking-it-to-the-next-level brand of shock rocker-ism, Cooper famously pointed out Manson wasn’t the first person to ever take a woman’s name and rock out with make up on. At the time of his show here, Alice Cooper was a mere 42 years old—just a baby in the grand scheme of things, but ancient by pop music standards. At the time of this blog, Marilyn Manson is 45 … perhaps ready for a comeback tour of his own? Carol Morsani Hall? Anyone? Alice Cooper show time was 7:30 p.m., tickets cost $19.75. Twenty-one years after his stop here for this show, in 2011, the Rock ‘n’ Roll Hall of Fame inducted the original Alice Cooper band into its elite pantheon. 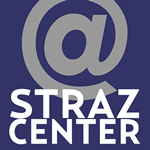 To our delight, the Caught in the Act staff discovered a box of newspaper articles and fundraising artifacts from the Straz Center’s early years, many from the inaugural 1987-1988 season. We decided to create a regular feature called From the Vault to share these snippets of performing arts history with you. Enjoy! Famed ballet dancer Mikhail Baryshnikov, the then-artistic director of American Ballet Theatre (ABT), brought a revival premiere of Leonide Massine’s “Gaiete Parisienne,” a work originally staged by Ballet Russe de Monte Carlo in 1938 and brought back to the stage by ABT in 1970. This engagement, which spanned five days and eight performances, typical then and almost unheard of for ballet companies on tour these days, also included Baryshnikov’s staging of Giselle, Balanchine’s “Symphonie Concertante” and Marius Petipa’s “Raymonda” Act III. The company also performed “Bruch Violin Concerto No.1” by Clark Tippet, who was a principle dancer for ABT at that time but later became a rather famous choreographer in his own right. 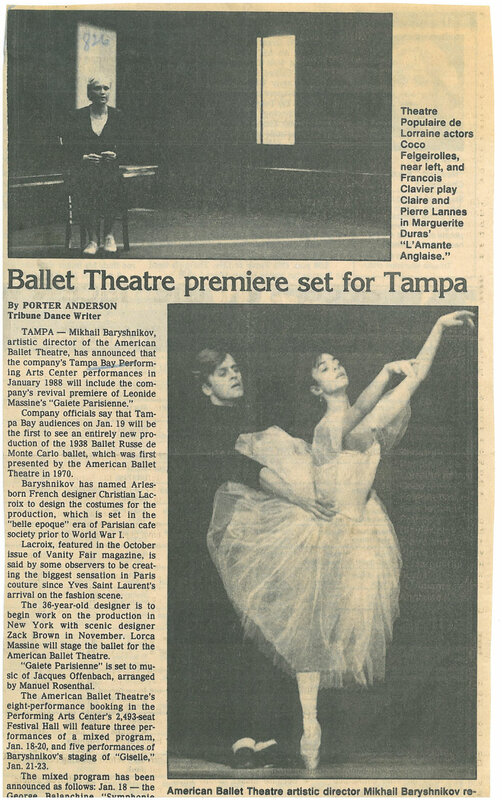 Tickets ranged from $10.50-$33.50, and, in case you were wondering (and some of you might remember), Baryshnikov didn’t dance with the company during this engagement, which ran in “Festival Hall” (Morsani) from Jan. 18-23, 1988. In the photograph, Misha works with a young dancer named Alessandra Ferri, who would dance the principle role in Giselle, and later become internationally recognized as one of the greatest dancers of her generation.